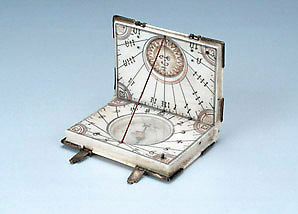 The presence of the maker's mark is not always decisive in the attribution of an instrument, as in this case, which has the mark painted inside the compass. A coronet was used by Paul Reinmann until his death in 1609, but the same coronet was used by another Nuremberg maker, Michael Lesel, from 1609 to 1629. The dial has the form of a book with brass clasps and spandrels, and has figures of saints on the outer sides of both leaves.